Headbands are the major accessory on this show! I just can't list them all! NO! headbands are for everyone! haha - they have some super cute ones at Target right now that are really cheap! I went crazy and bought like 7 last week!! The pearl headband can be found at Forever 21...hopefully they still have it. Headbands everywhere, always, early & often :) no holds barred! Rock your headbands sister. Best second day hair accessory of all time. I am a proud supporter of headbands POST college!!!! I think you can wear headbands anywhere you want, although I have to say I lean more towards the functional than the decorative! But I will always rock a headband at the gym and on bad hair days! Oh..I have never watched this show but have it available for me to watch starting with season 1. I am going to start this weekend!! lol I love the headbands..They are so cute! I say go for headbands college or not! I don't think you get too old for headbands! I'm 26, does that mean I need to put mine away? Love the bows and pearls! I got a replica of the pearl at headband at Forever 21 a while back, you might want to check there! He is wrong wrong wrong! i rock the headband in my office! Although I adore Dan, I don't think so! I am past college and still love headbands! I love that Blair always has one on, they are great! Dan is wrong! I am a college sophomore and am just getting into a severe headband phase. 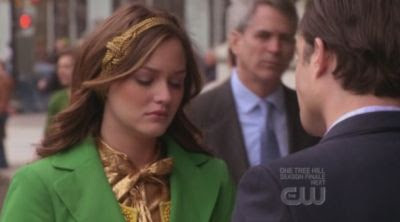 I have a gold knot one similar to the one Blair is wearing and I absolutely adore it! Dan is wrong! I love headbands and still rock them 2 years out of college! I love, love, love, headbands! My favorite is the vintage gold knot. I must have this! Have you seen Ann Taylor Loft's new handbands...so cute! Dan is wrong! I totally wore headbands all the time in college and still do. Yay for headbands! Blair has such fabulous ones. Wrong! I wore headbands all the time in college, and still do now. There is nothing wrong with them! I wear one almost every day and I'm a college sophomore! I got a pearl one like that at Forever 21 at the end of June-only $1.50! I wear headbands EVERYDAY. I have a pearl one that was like 4 dollars from Forever 21... and one with smaller pearls from J. Crew! I do not agree with Dan! I love headbands, wierd I know! That Blair trully has some beauites!! Jennifer Behr victorian crystal and silk satin headwrap - LOVE IT! ugh I disagree. I for one am obsessed with headbands...I currently have 35+ headbands. 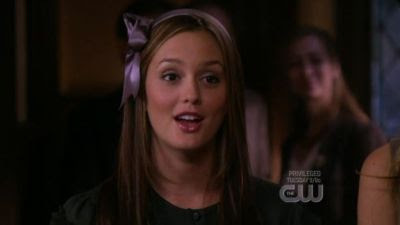 And I am so irritated that ever since Dan told Blair that she hasn't worn any yet on Gossip Girl since!!! I definalty don't agree with Humphrey! I couldn't get through my 8ams without a good headband to pull my look together! I love headbands - I still wear them all the time - at work and at play - they are my favorite accessory! P.S. Check wedding shoppes for a pearl headband - that's where I found mine! Kate, I LOVE these posts. Thanks for telling us where they buy Blair's headbands. I love the Jennifer B. vintage headwrap. It's waaaay out of my budget... cry. I still wear headbands and I graduated from college a long time ago. Considering that I started whereing headbands mostly during university, I'd have to diagree with Dan. Yah for headbands in university! Don't know if you have an Icing (it's an off-shoot of Claire's) anywhere but last time I was in there, they had a number of bow headbands. I'm WAY over college age and still love to rock the headbands! Love this post! Headbands are acceptable everywhere in my opinion. Thank you for posting links to some of these lovelies. For last week's Halloween episode, I was in headband heaven. I adore headbands and own too many to count. I have the same Jennifer Ouelette as Blair, but in a deep purple and it's one of my faves. Love this post a lot! I have a pearl headband like the one you want, from Anthropologie. Purchased around Christmastime last year. It has elastic on the bottom, so it's not a "hard" shaped headband but I get a lot of compliments on it! Good luck finding one! HEADBANDS IN COLLEGE ABSOLUTELY! I WEAR THEM EVERYDAY.